CEJA envisions a fundamentally new energy system for our state — one that is just, democratic, equitable, and composed of genuinely clean energy. We envision a California where our rooftops are blanketed with solar, our children can finally breathe clean air, and dirty power plants and oil refineries are shut down, and low-income people of color receive good-paying local clean energy jobs. Communities across the state have paid the highest price for dirty energy. We have too many kids suffering from asthma and parents who can’t go to work because they are too sick. Dirty energy is driving climate change, while literally poisoning our families. We’re tired of an economy that leaves our communities sick. We need to unplug corporate polluters and power-up our community participation in creating local, green economic development. CEJA is leading dynamic campaigns where we put energy decisions in the hands of the community. Our goal is to pass policies that will build small-scale solar and other renewable energy in the most vulnerable communities, while creating thousands of local jobs and investing millions of dollars in low-income neighborhoods that need it the most. Building energy efficiency, rooftop solar, and other clean energy infrastructure creates physically healthier neighborhoods, allowing communities to transition off of fossil fuel polluting sources, and improving economic prospects in low-income communities of color. CEJA is building democratic, equitable energy solutions that do not reproduce ecologically and socially harmful energy and social systems, starting with the communities who have borne the burden of pollution for decades. 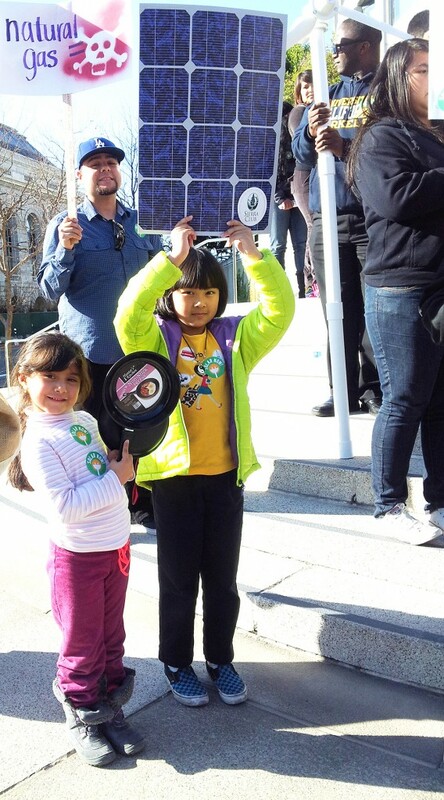 We want California to transition to 100% equitable renewable energy by 2050. We believe that transition must start with people and communities who are most directly impacted by our current fossil fuel economy. We are working to ensure environmental justice communities and their needs are prioritized in California energy policies. We are advancing policies at the California Public Utilities Commission that promote a transition off of fossil fuels and promote local renewable energy. We are building CEJA’s expertise and alliances with labor and groups in the clean energy jobs sector to help win policies that lead to meaningful, equitable local jobs. We are growing our movement and organizing communities to build out local renewable energy generation and develop good jobs. We want to flip the script on energy policy-making – where community members drive decisions at the statewide level rather than the utilities and large energy developers, so we build energy infrastructure in the best interest of human health, the economy and the environment.